Thank you for joining me for this fortnight's round-up of Charnowalks events. The dominant event of the fortnight was of course the first outing for 'The Unquiet City', an exploration of nearly two millennia of unrest in the City of London. The earliest story is Boudica's uprising in 61; the most recent is the Occupy London occupation of St Paul's Churchyard, from October 2011 to February 2012. As usual with the first outing of a new Charnowalk, this was a reduced-price preview at a flat rate of £5 a head. I always find that the first outing will suffer from teething troubles, hence the special low rate. It's an idea that I lifted wholesale from the theatrical world, where there are preview performances at reduced prices so that the company can get the feel of the venue. Footprints have various festivals during the course of the year, including the annual RiverFest and LitFest. The two annual festivals feature the inflation-busting offer of a season ticket which allows unlimited access to all of the festival's tours. So far the record is twenty-seven separate tours taken in one month by a season ticket-holder. 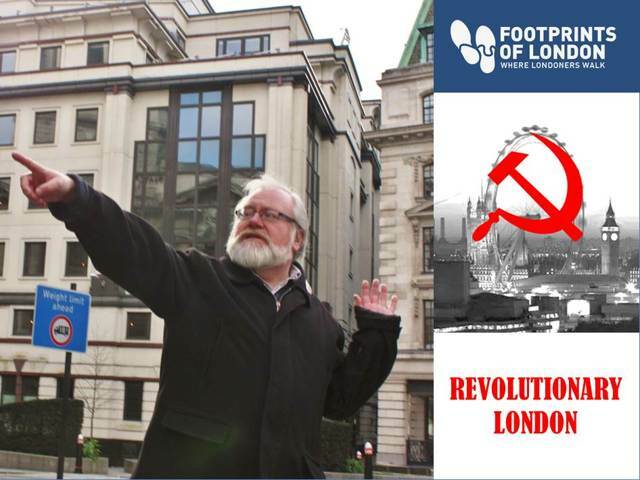 I had hoped to concentrate on the East End this year and to rein back the City stuff, but as you can see I've started the year with a new City tour. In connection with a commission, I will be bringing to light another tour which is, strictly speaking, a City tour, although the earlier stages will be in the Borough, an area which was part of the City until it was transferred to the Metropolitan Borough of Southwark in the 1920s. The new tour has the working title 'A Dickens of a City': I know, I know, but what are you going to do? It's a Dickens tour in the City! I've been meaning to do one for some time, but it's quite an undertaking. 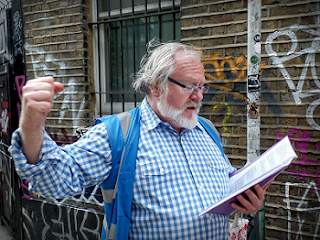 The aim is that it is to be a tour with readings, my third such tour after 'Much Ado About Trading' and 'Bethnal Green in So Many Words', both of which appeared last year. The problem about Dickens is that though what he wrote was excellent stuff and makes for great reading, he actually wrote a huge number of reflections on London in so many moods. 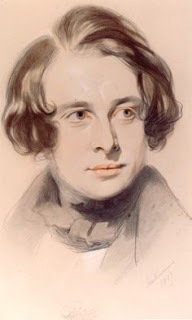 To create a tour based on insights about London's story gained through Dickens' works, even if you limit it to a specific area, requires a deal of arbitrary selection. So I shall do what seems to work, and we'll see where we go from there! So far we're talking Little Dorrit, The Pickwick Papers, Oliver Twist, David Copperfield, Martin Chuzzlewit and Our Mutual Friend. I suppose once the first one's done, I can progress to sort out more material and then perhaps split it - with one north of the River and one on the south. It'll take time. To round up, February is steaming through 'City Sundays', with the final tour this coming Sunday. 'Engineering Change' explores the relationship between engineering and the City, and how mechanical, electrical and civil engineering changed and shaped the City. 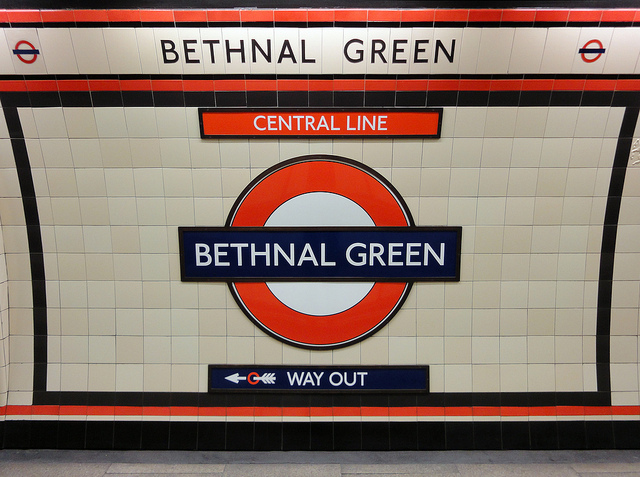 Next month features Bethnal Green Sundays, which celebrate my very own manor. I've lived here all of my life, and so I'm giving all four of my local tours. 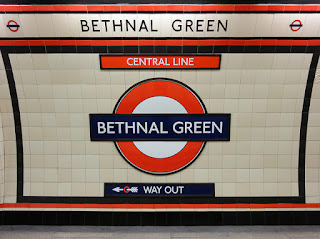 We begin with seeing how the Hamlet of Bethnal Green coped with being absorbed into the metropolis of London. Then we lift a few stones to uncover stories of crime and wrongdoing in the area in the eighteenth, nineteenth and twentieth centuries. The following week sees the impact World War Two had on the area. We finish with a tour featuring site-specific readings which explore Bethnal Green through the writings of authors including Iain Sinclair and George Orwell. It also features a fight scene from King Dido at the very footbridge where it occurred. Talking about literature, I'm planning April's Sundays to have a distinctly literary theme. Stage and Page Sundays are coming! Well, it's my birthday on 24 April and literature's my thing, so watch this space! Please keep up to date with my various doings by subscribing to this blog. Also you can join my monthly mailing list by e-mailing me on charnowalks-bgn@yahoo.co.uk and I'll add you. This'll give you a monthly listing, plus notifications of extra goodies as and when they happen! That'll do for the moment - more details about things to come will be in the next instalment! I hope to see you on the streets some time soon.